KIA-B/O B-17G #44-8422 Duffy's Tavern 359BS (BN-N) blew up after take-off and crashed near Atchon over Much Wenlock. Why Was I a Survivor? November 11, 1944, Armistice Day . . . but, for us it was just another fighting day to get the blasted war over so we could all go home. We were stationed at Molesworth, England, part of the famous 303rd, "Hell's Angels," B-17 Bomb Group. I was the Waist Gunner on the crew of Lt. Paul Stephan. 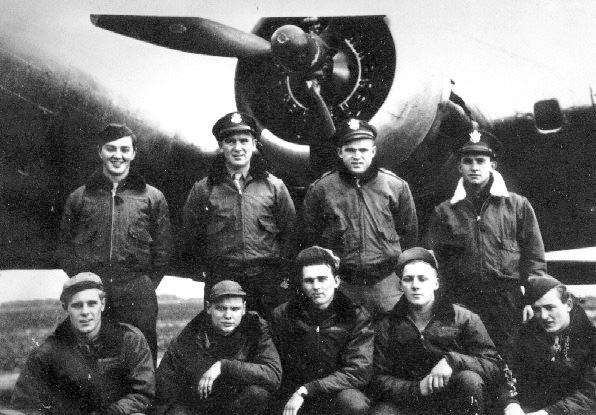 Other crew members were: Lt. John Clingler, Co-pilot; Lt. Harold Lewis, Navigator; Sgt. Tom Tapley, Togglier; Sgt. Dwight Phillips, Engineer; Sgt. Ray Ladurini, Radio; Sgt. Ed Harris, Tail and Sgt. Stan Keyes, Ball. The whistle blew at 3:30 AM. "Breakfast at 4, briefing at 4:30." It was a typical English morning. The fog was so thick, our clothes were damp by the time we reached the mess hall. We talked as we ate: "I'll bet we hit Berlin today, better eat all we can." "I hope it's a milk run." "With this fog, we'll be back in the sack by 6 AM." . . . continued . . .